Over 160 million buyers can't be wrong! That's how many people are buying on eBay, and that number only continues to grow. 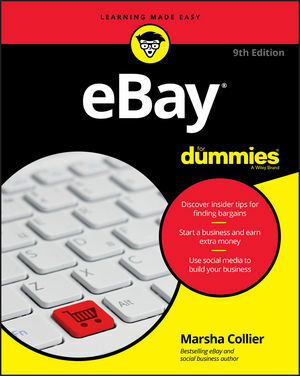 If you're an eBay beginner looking to find bargains or make money by selling, look no further than eBay For Dummies. Inside, you'll find all the tips and strategies you need to become a successful buyer or seller on the world's #2 e-commerce site. Written by Marsha Collier—who was one of the earliest sellers on eBay and one of their first elite 'PowerSellers'—this new edition offers the latest updates on eBay's selling tools, payment options, how to enhance your eBay experience through social media, and so much more. Buyers will discover how to find bargains, evaluate items, choose between bidding or buying outright, select the best shipping option, and close the deal. If you're a seller, there's a ton for you, too! You'll find tips on researching what to sell, creating effective listings, packing and shipping your items, and offering excellent customer service. Whether you want to buy like an expert or make money the eBay way, there's something for every aspiring eBay aficionado in this time-tested guide! Marsha Collier has been on eBay since the site launched. She's a Top Rated Seller and an expert on using social media to enhance business. Over one million copies of Marsha's bestselling titles on eBay, social media commerce, and online customer service have sold around the world. Forbes magazine named her one of the "Must Follow Marketing Minds on Twitter".